My question – what happened to the Tea Partiers? I was surprised (no doubt naively) about the result of the Republican vote. I had heard and read much about the Tea Party criticizing big and overreaching government and wanting to restore respect and adherance of the Constitution. I assumed that they included the fourth amendment in the list of Constitutional principles they would endeavor to respect. The specific provisions of the PATRIOT act in question allow the government to perform warantless searches of people's personal information and communication, which to me seems pretty much like a violation of the fourth amendment. So, I expected the Republican vote (or at least the Tea Party vote) to not be so swayed in support of these specific provisions of the PATRIOT act. Perhaps the Tea Partiers (as well as others who voted to extend these provisions) might argue that we have a terrorist threat that warrants these warrantless searches. This could be a reasonable argument worth discussion, but it is incompatible with the promises to strictly adhere to the Constitution. My message to these Tea Partiers who voted "Aye": if you vote to extend these provisions, just come out and admit that you believe that the Constitution is not always worth following, but please don't be hypocritical and "defend" the Constitution while you vote against it. Now I proceed to step off the soap box and focus on the analysis of how the different members voted. Members of the Tea Party caucus from July 2010. A couple of problems exist with this list: it does not include any of the new congress members voted in in November 2010, and there seems to be some discrepancy between the "Tea Party caucus" and the Tea Party movement. Tea Party Activists list of winners in the 2010 election. This is the list I used for my analysis. Also out of curiosity, I took a look at how the Congressional Progressive Caucus (also referred to as Socialists) voted. I obtained the list of Progressive members here. Following are the breakdowns for your enjoyment and reflection. You can download the raw data here. 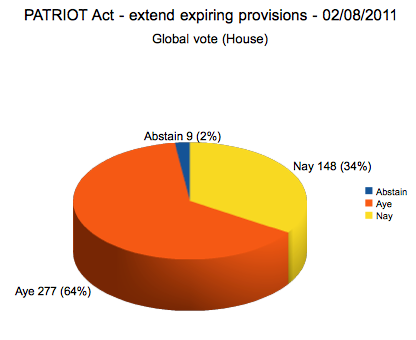 Globally, the House voted 64% in favor of extending the PATRIOT act provisions. This fell just short of the 2/3rd vote needed to pass it on the fast track. It's safe to say that the Republicans voted overwhelmingly in favor of the PATRIOT act, with 87% of Republicans voting to extend the controversial provisions. 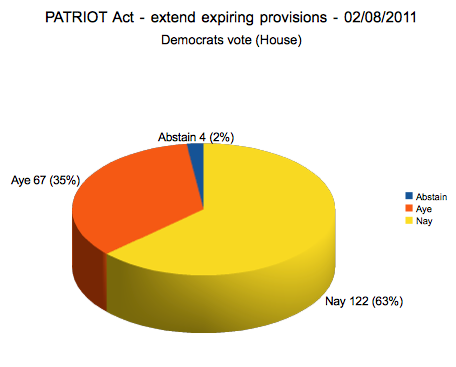 While a majority of Democrats voted against the PATRIOT act provisions, this party was more divided than the Republican party, with only 63% voting “Nay”. This is what surprised me. 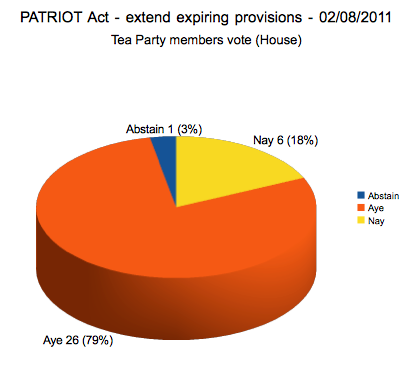 A strong majority (79%) of Tea Party congress members voted in favor of extending the PATRIOT act provisions which violate the fourth amendment (oops, soap box!). This does represent a slightly smaller majority than the overall Republican party's 87% “Aye” vote. According to this list, 14% of all the Republicans in the House are Tea Partiers, yet 23% of the Republicans who voted “Nay” are Tea Partiers. 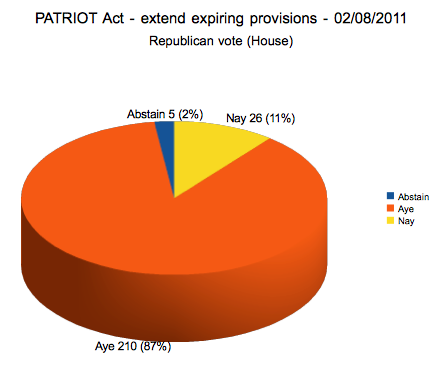 This is just another way of seeing that Tea Partiers were more likely than other Republicans to vote against the PATRIOT act provisions. However, they still mostly voted for it. 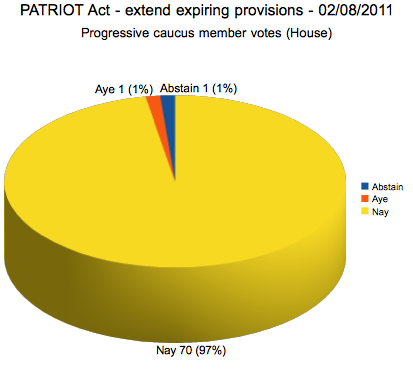 The Democrats who are Progressives are practically unanimous (97%) in their opposition to the PATRIOT act provisions. Here is the source for the list of new members. 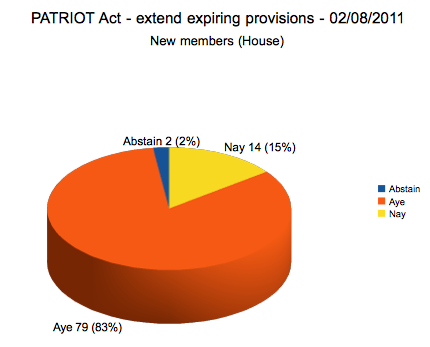 The new members voted overwhelmingly (83%) to extend the PATRIOT act provisions. The following graph includes all congress members who have been in congress prior to November 2010. 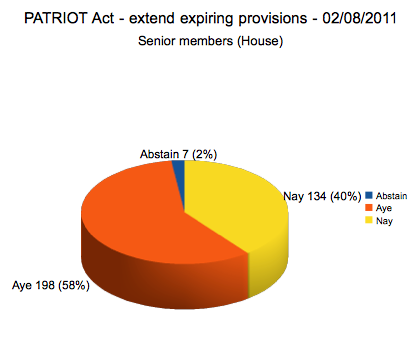 The senior members appear to be quite divided on the issue, being the most evenly-split vote of all the groups discussed here, with 58% in favor and 40% against the PATRIOT act provisions. Tea Partiers are strongly in support of the PATRIOT act provisions, although they oppose it slightly more than Republicans as a whole. Progressives are practically unanimous in opposing the PATRIOT act provisions. The most divided groups are the senior members (regardless of party), and Democrats (regardless of seniority). Virgos and Scorpios on the road: Who's more at risk? Last week, Allstate insurance published a press release, with a graph displaying the number of accidents in 2010, grouped and sorted by Zodiac sign. The data was based on the actual birthdays of customers. At first glance, one would be surprised to find that Virgos have a much worse driving record (8 times as many accidents!) than Scorpios. Astrologists and the superstitious would actually expect a lower accident rate for Virgos, known as perfectionists. On the other hand, "compulsive and obsessive" Scorpios would be expected to speed and exhibit risky behavior including tailgating and frequent lane-changing, leading them to a higher accident rate. Rational people would also be surprised at the results, expecting a uniform distribution of accident rates, with no dependency on Zodiac signs. Most of the information here can be found in the Wikipedia article on the Zodiac. A video on YouTube by dupeduperson also helped me to visualize this. Three types of Zodiac systems exist: Tropical, Sidereal, and IAU constellation boundaries. The basic principle shared between these systems is that the year is divided into 12 (or 13) periods, each of them associated with a constellation. At a given period, the sun, the earth, and a given constellation are aligned (the sun between the earth and the constellation). In western culture, the tropical system is the most well known. In this system, the year is divided into twelve equal parts. When the system was first created, sometime around the 7th century BC, on the first day of spring (the vernal equinox), the sun was "pointing" to the Aries constellation. The first month of spring was therefore associated with the Aries constellation, and the other eleven months associated with the nearest aligned constellation for that time of year, as the earth rotated around the sun. The seasons of the earth (and our current Gregorian calendar), however, do not depend on the position of the earth around the sun, but rather how much, and in what direction, the given hemisphere of the earth is tilted towards or away from the sun. The time between the vernal equinoxes, and the time for the Earth to complete its orbit around the Sun, are almost equal, but not quite. This is due to gradual change in the tilt of the Earth's axis of rotation about itself (precessional cycle). A page from the NCDC website has some graphics which are helpful in understanding this. The earth takes about 365.256363 days to rotate around the sun, but the time between vernal equinoxes (the length of a calendar year) is 365.242374. This slight difference means that each year, at the beginning of spring (March 20 or 21), the earth is in a slightly different position on its orbit around the sun, thus with a slightly different alignment with the constellations. (The positions of the constellations, relative to the sun, are for practical purposes permanent.) Hundreds of years since the creation of the tropical Zodiac calendar, the sun is no longer aligned with the Aries constellation on the first day of spring. However, in the tropical Zodiac system, the beginning of spring has continued to be traditionally associated with Aries, regardless of the actual alignment of the constellation. The Sidereal (Hindu) Zodiac system takes the precessional cycle into account. In the Sidereal Zodiac system, the Zodiac periods are based on the position of the Earth in its orbit around the Sun, and thus based on the alignment with the constellations (and not with the seasons of the Earth). Because of this, the dates of each period change over time. In 2011, The Aries period in the Sideral system begins on April 14, while the Aries period in the tropical system begins, as it always has (applying the Gregorian calendar retroactively), on March 21. 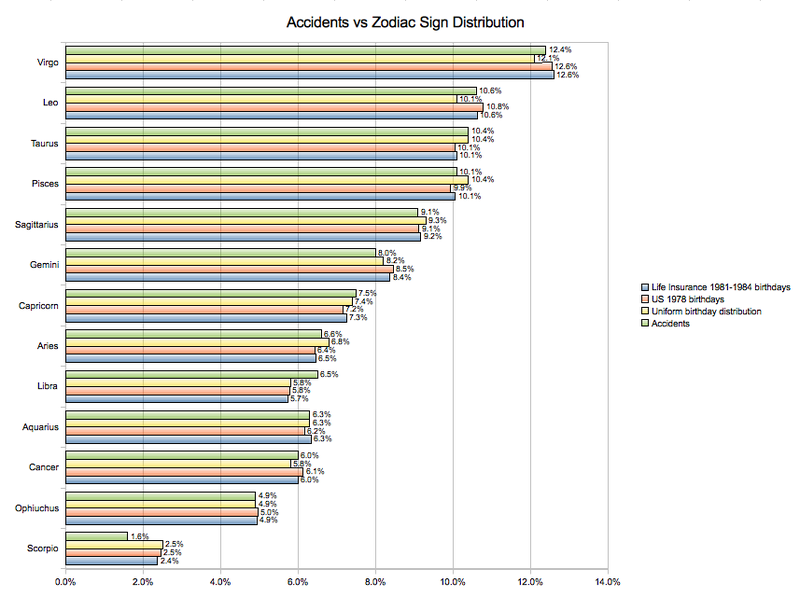 Accident statistics: which Zodiac signs are really more at risk? The start and end dates are based on the 2011 dates from Wikipedia. As we can see, the percentage of accidents per Zodiac sign correlates directly with the percentage of people born in that Zodiac sign, with the biggest difference between accident rate and population percentage being less than 1% (for Scorpio). The proportion of accidents per Zodiac sign is directly related to the percentage of the population born under that sign. In other words, Zodiac signs are no indication of risk of accidents. Being born under a particular sign does not impact an individual's personality in any way that would affect his or her driving record. There are more accidents involving Virgos simply because there are more Virgos out there driving cars. a) This publicity by Allstate should have been received by the public as an obvious joke. Anybody who was offended by the press release should seek psychiatric counseling. b) Perhaps Allstate could have anticipated the public's incapacity to understand or accept a joke, but it's really too bad they decided to retract it and apologize, saying “We deeply apologize for any confusion this may have caused.” Humor like this should be welcome in our society.